The Sun Valley Center for the Arts will close its "Water" exhibition with a project that could have lasting effects for years to come, spearheaded by artist Basia Irland. Irland's place in the exhibition at The Center in Ketchum was to focus patrons on the ecology of water and on making connections among people who live near rivers. On Saturday, Nov. 6, Irland will lead a "gathering" for the Sun Valley Center exhibition, which will culminate in a release of native seeds into the Big Wood River in Ketchum. The public is invited to join Irland for a closing ceremony and release of her "ice books," which are filled with riparian plant seeds. Clay fish made by students and visitors to the exhibition—also filled with seeds—will be released with the ice books. The event will start at The Center in Ketchum at 10 a.m. Juice, coffee and pastries will be served while visitors can take one last look at the "Water" exhibition, which features artwork by six contemporary artists. Irland will speak about her work, which combines ecology, installation art and public collaboration to draw attention to threats to water supplies. Irland has spent 30 years working on international water issues. "It's the most important thing in the world," she said. Irland is a retired professor in the department of art and art history at the University of New Mexico, where she established the arts and ecology program. Her interdisciplinary projects include a series of "Gatherings of Waters," which connect people along a river's banks and then document those connections in backpacks containing canteens, logbooks, maps, video documentaries and photographs. She has organized "gatherings" in Canada, England, Colorado, Washington and along the 1,875-mile length of the Rio Grande from southern Colorado through Texas and Mexico to the Gulf of Mexico. Irland visited the Wood River Valley in July and spent time along the Big Wood River, photographing riparian zones and talking with local residents knowledgeable about the river and its ecology. She created a sculpture inspired by her visit, "A Gathering of Seeds Repository," which has been on display in The Center's exhibition alongside a backpack she made for an earlier "gathering" in Colorado. With the melting of Irland's "ice books" in the Big Wood, native seeds will be deposited along the river's banks. "It's another way of dispersing seeds," she said. "I think of this is an international ecological language." During the weeks of the "Water" exhibition at The Center, students and exhibition visitors embedded seeds into fish made of local clay—also for release. "All the clay for the fish was from the Big Wood River," Irland said. "There are a lot of reasons to put the ice book with its seeds in the river. The seeds will eventual sprout to provide shelter and habitat." Some of the clay fish have messages of water conservation inscribed into the clay. "The process of the ice books are ephemeral," she said. "And, the material is always region specific. The book is important to me because it is a form of communication." Irland said problems involving water are everywhere. She has traveled the world learning about water issues from the mountains of West Virginia to the deserts of Africa. Irland has embarked on projects about water-borne diseases. "I work with musicians and write songs about how to avoid being sick from the water," she said. "The songs go out to communities. They are the best way to capture people's attention because of the lack of education in poor countries." 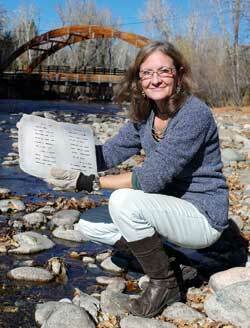 A procession to the Big Wood River will take place after Irland gives a presentation on her work on Saturday. For details, call 726-9491.